The study abstract, "Cell Phone Ownership and Cyberbullying in 8-11 Year Olds: New Research," will be presented Monday, Sept. 18 at the American Academy of Pediatrics National Conference & Exhibition in Chicago. "Parents often cite the benefits of giving their child a cell phone, but our research suggests that giving young children these devices may have unforeseen risks as well," said Elizabeth K. Englander, Ph.D., a professor of psychology at Bridgewater State University in Bridgewater, Mass. According to the researchers, the increased risk of cyberbullying related to phone ownership could be tied to increased opportunity and vulnerability. Continuous access to social media and texting increases online interactions, provides more opportunities to engage both positively and negatively with peers, and increases the chance of an impulsive response to peers' postings and messages. "At the very least, parents can engage in discussions and education with their child about the responsibilities inherent in owning a mobile device, and the general rules for communicating in the social sphere," Englander said. Englander will present the abstract, available below, on Monday, Sept.18, from 5:10 p.m. to 6 p.m. CT in McCormick Place West, Room S106. The study of cyberbullying has most often focused on adolescents. This study examined survey data on 4,584 students in grades 3, 4 and 5, gathered between late 2014 and 2016, as schools opted to survey their students about bullying and cyberbullying. Most, but not all, schools participating were in Massachusetts. Altogether, 49.6% of students reported owning their own cell phone. Older students were significantly more likely to report ownership; 59.8% of fifth graders, 50.6% of fourth graders, and 39.5% of third graders reported owning their own cell phone. Younger children were less able to define the term "cyberbullying" correctly, but 9.5% of all children reported being a victim of cyberbullying. Cell phone owners were significantly more likely to report being a victim of cyberbullying, but this was only true for children in Grades 3 and 4. Although fewer students overall (5.8%) admitted to cyberbullying their peers, more cell phone owners admitted to cyberbullying, and this was true for all three grades (3, 4 and 5). When bullying in school was studied, only the third graders were significantly more likely to be bullied in school if they were cell phone owners, although both third and fourth grade cell phone owners were more likely to admit to bullying. 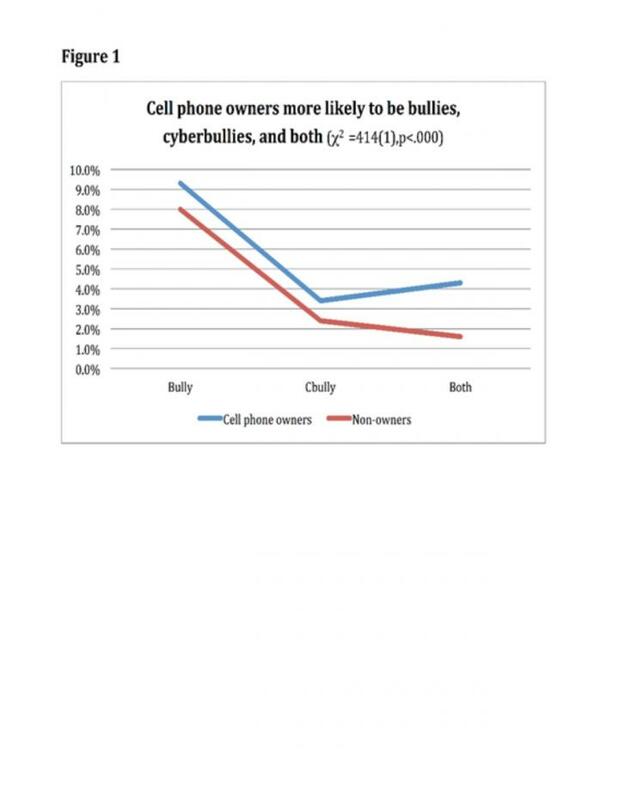 Overall, cell phone ownership was more strongly related to cyberbullying (vs. traditional bullying) and the observed relationships were stronger among younger subjects (those in fourth, and especially third, grade).